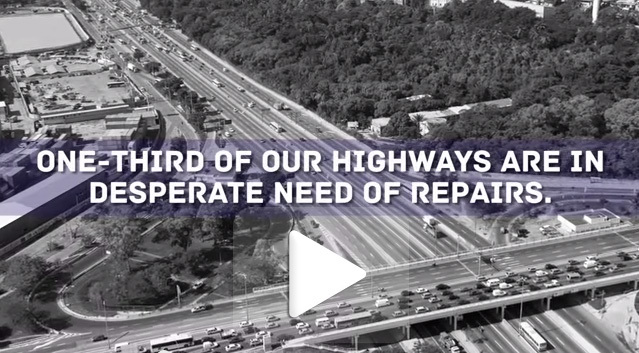 Tennessee–based Astec Industries invoked President Dwight D. Eisenhower in a creative new video aimed at helping advance a Highway Trust Fund (HTF) solution before the federal highway/transit funding authorization expires on May 31. As excerpts of a 1954 Eisenhower speech in Detroit are heard in the background, the video flashes shots of crumbling infrastructure and notes how one-third of the nation’s highways are in desperate need of repair, how public spending on transportation is at its lowest point since 1947 and how for every $1 billion invested in infrastructure, 35,000 jobs are created. Eisenhower, who saw firsthand the need for a network of Interstate highways during a 1919 cross-country trek from Washington to San Francisco that took his motorized column of 86 vehicles 56 days to complete because of poor road conditions, signed the National Interstate and Defense Highways Act in 1956.